Tower Bridge Exhibition partnered with TimeLooper to create immersive experiences for its museum section, with the goal increasing visitor numbers, controlling visitor matriculation, increasing revenue and integrating Tower Bridge into city-wide campaigns. TimeLooper’s Tower Bridge experience enables visitors to see the City of London at different periods in history and The Bridge at different stages of operation. Visitors can view the Great Fire of 1666 spread throughout the city, re-live the construction of the bridge from the catwalk in 1891, and watch the steam engines grind into action in the engine room for a bridge lift in the early 20th century (before the bridge’s electrical overhaul). TimeLooper worked directly with Tower Bridge’s exhibition team on the project. The process began with an extensive research period and documentation study at their direction to understand the time period and content focus. Tower Bridge supplied TimeLooper with a breadth of historical primary sources highlighting the Victorian Period in London and the construction of Tower Bridge. Once details of the historical recreation of the surrounding environment were agreed upon, the TimeLooper team then moved into the production phase to begin capturing live action in the studio and bring the stories to life. Visitors to the National Mall in Washington, DC easily take in the beauty of the monuments and memorials of the National Mall, but the Mall’s limitations in terms of exhibition development leave a large gap between the history the monuments represent and what visitors actually learn about the people / moments behind them. TimeLooper, Close Up Foundation, and the National Park Service partnered to develop an on-site experience that highlights the history of seven iconic landmarks at the National Mall through immersive virtual reality storytelling. TimeLooper and Close Up collaborated with NPS’s interpretation team to ensure historical accuracy of all content. National Parks Service opened up their historical archives and provided insight and direction for the collaboration. 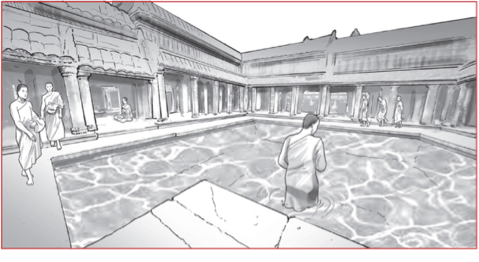 TimeLooper launched a partnership with Ministry of Tourism in Cambodia and Apsara Authority to help design immersive experiences for their nearly 3 million annual visitors to Angkor Wat UNESCO Heritage Site. Their aspiration was to bring the stories of the Khmer Empire to life in a new and engaging way. In addition to creating a “wow” factor for visitors that reaffirmed the Ministry’s commitment to modernizing the on-site experience, conservation of the assets and culture was of the utmost importance.